Adventures in Globetrotting: Finding the joy and humor while facing the challenges of teaching and living in Mali, West Africa. 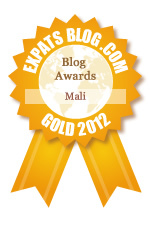 ExpatsBlog.com Expat Blog Awards 2012: Mali Gold Award! This blog won the Gold Award for best expat blog in Mali! what an amazingly informative and amusing blog. I look forward to each new entry! Always enlightening to read this blog, perfect mixture of information and comedic occurences.